35716LF-ECO is rated 4.1 out of 5 by 9. Rated 2 out of 5 by mbflake from leaky faucet handle Used delta fixtures throughout our new home. Used two of these in one bathroom. One is leaking around through handle. Plumber installed around seventeen months ago. Rated 3 out of 5 by ElDee from Looks great, plastic locking won't tighten I bought two of these at Lowes. Actually, four if you count the number returned. The locknuts would spin up but when tightened enough to hold handle in place the nuts acted like they we stripped and would pop down about a quarter inch. Buy selecting handles and locknuts from four sets I was able to get three of the four handles tight. I had to use PTFE on the four one, but after three weeks the nut failed again. Just wondering when the remaining handles will fail. 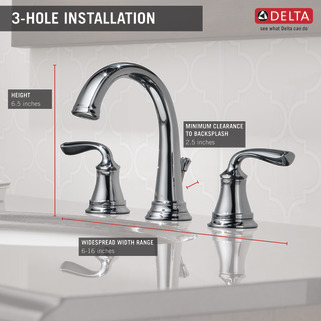 Rated 4 out of 5 by JAYTEE from Very attractive, easy to install Good faucet but a part was stripped making tightening the faucet to the sink impossible. Called Delta who sent a replacement part right away. Rated 3 out of 5 by Jeral999ok from Poor mounting plastic nut I like the design of these faucets and water spout the underside connections are nice and easy quick connect and such but the plastic nuts for mounting the faucets are very poor and I ne came cross threaded on my unit and was unable to tighten down the faucet properly it should be made with a steel thread not just plastic for tightening the faucet down properly so they don’t move! Otherwise, nice quality! 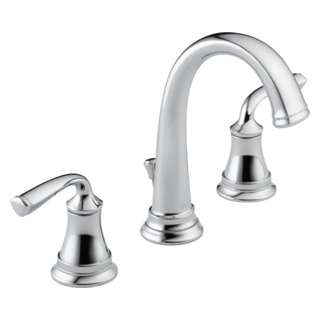 Rated 5 out of 5 by MikeRVA from Great faucet, good value and awesome customer service The faucet looks nice and was relatively easy to install (as far as faucets go). I give Delta double points on this due to their customer service though. When I was installing the mirror over the vanity and faucet, it slipped out of my hands and broke one of the faucet's valves. While the valve handle is metal, there is a plastic stem (unfortunately and that's what snapped). Even though I was able to glue, I thought it best to order a new part in case it didn't hold. I was having trouble finding the part so I emailed Delta. As with most emails to retailers, I assumed it would go unanswered. Not the case, however as I had a response the first business day asking a couple clarifying questions about the part I needed. I replied with pictures as requested assuming that I would get info back about where and how to order. The next email that I got was a Delta parts order acknowledgement letting me know the part order was being processed. It showed up a few days later. Delta never asked how the part got broken, but it surely wasn't their fault. I'm just super-impressed they took it upon themselves to act without any back and forth. Well done Delta! Rated 5 out of 5 by cornmiller from Very easy to install with good instructions The style is very pleasing and goes well in our bath. I will never buy anything but Delta because they stand behind there products. My faucet is leaking from the spigot. How do I fix this? Thanks! Can I order a new handle? will a part RP25513 work to fix hot water leak from faucet on my Lorain faucet model# 35716LF-SS-ECO? 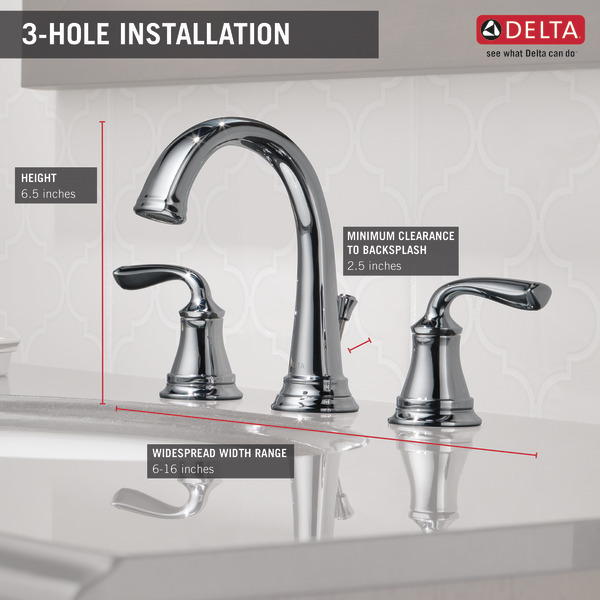 How best to clean water spots on Delta Lorain Stanless bathroom faucet? Is the aerator removable to allow cleaning of the aerator screen? If so what is method? In the store when I tried many different faucets, both handles actually actually hit a stop. Is that how this is supposed to turn off? Is this made with high quality metal parts or the plastic parts like what is sold at Home Depot?